A stone's throw from the Colosseum and Termini Station, in the heart of old Rome, in an elegant Historical Palace. The accommodation is situated in an elegant '800 Palace, former home of the Marquises Ciacci, protected by the Ministry of Cultural Heritage. Overlooking from the balcony of the house you will enjoy a view of the Basilica of Santa Maria Maggiore on the Esquiline and the famous Via Panisperna. 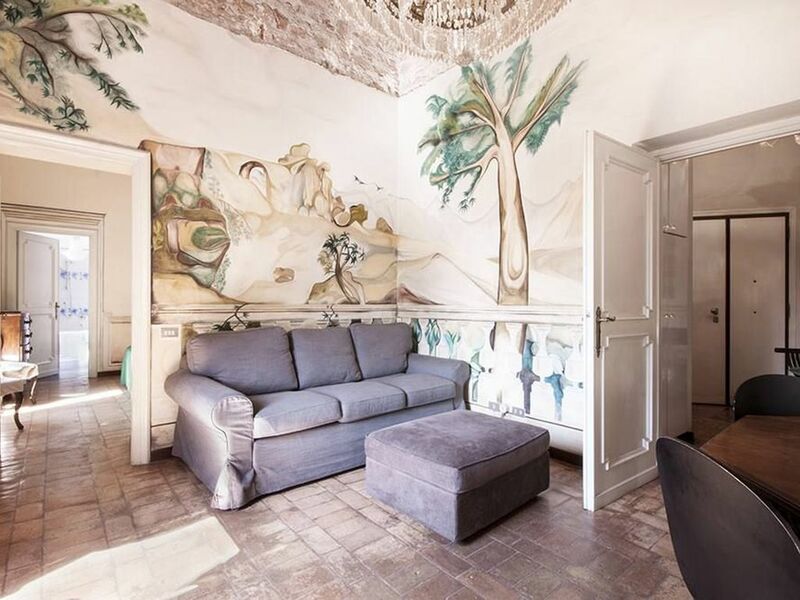 The frescoes on the walls, original high ceilings and terracotta tiled floor characterize the house, located on the 4th floor, with elevator, and consists of an entrance hall, a dining room and living room, a small kitchen, double bedroom, another double bedroom with loft, two bathrooms (one with bath, sink, toilet and bidet and the second bathroom has only a sink, toilet and bidet) and a balcony. also two extra beds available, so the housing, which has a standard capacity of 4 people, can accommodate up to 6 people. The apartment is equipped with TV, air conditioning, washing machine, dishes, microwave oven, Wi-Fi. How to get home by public transport: from Termini Station is just a short and pleasant walk (about 350 meters) on the elegant Via Cavour and you'll be home. If you arrive at the airport Leonardo da Vinci Fiumicino airport you can reach the Termini Station with the Leonardo Express Line. If you arrive at Ciampino Airport you can reach Termini station directly with the bus terminus in the square that has the airport. Information for those arriving by car: Via Cavour there are no traffic restrictions. The street parking is free on weekends and during the night hours on working days. Those who wish can take advantage of various garage near the house. A 50% payment is required at the time of booking and the balance will be paid in cash at check-in; The tourist tax of € 3.50 per night per person (from 10 years old) is to be paid in cash at check-in; Check-in time is between 15 and 20 and check-out is until 11 am LATE CHECK-IN (to be paid in cash upon arrival) - from 20:00 to 23:00: € 30 - after 23:00 € 50 Please advise in advance (at least one week before check-in) the beds will be otherwise prepared in a standard way (double bed depending on the number of guests) and it will no longer be possible to change them. What a fabulous place. Very Comfortable. Perfectly positioned apartment in the center of everything. We stayed here several times already so that we could be central to all the things we needed including the metro and the train. The apartment is beautiful and very spacious. Definitely check the availability as this one is a keeper. Perfect location in a wonderful city. The placement could not be better. Close to the antiquities, the subway and the train. The apartment is well appointed and very large. We will definitely use this apartment again. We loved the location of this apartment. Close to many of the main attractions in Rome. Very close to the train station. We loved the big windows that we could open to let fresh air in. I have a bad back so the very firm mattresses were a little uncomfortable to me but if you enjoy a firmer mattress you won't have any issues. Roberto was pleasant to work with and extremely responsive to questions. We would stay here again! Elegant and perfect for our time in Rome! Couldn’t have asked for a better location and atmosphere within the apartment! The property is charming, the location excellent, and Roberto a thoughtful and considerate host. Beautiful place, very clean, and spacious. Would recommend, close to everything, able to walk to colosseum, Trevi fountain, and train station. Thanks for everything and I hope to see you again in Rome! È richiesto un pagamento del 50% al momento della prenotazione ed il saldo sarà pagato in contanti al check-in; È richiesta la tassa di soggiorno di € 3,50 a notte a persona (dai 10 anni compiuti) da pagare in contanti al check-in; L'orario di check-in è compreso tra le ore 15 e le ore 20 ed il check-out è fino alle ore 11 LATE CHECK-IN (da pagare in contanti all'arrivo) - dalle 20:00 alle 23:00: € 30 - dopo le 23:00 € 50 Siete pregati di comunicare in anticipo (almeno una settimana prima del check-in) la disposizione dei letti altrimenti saranno preparati in maniera standard (letto matrimoniale in base al numero degli ospiti) e non sarà più possibile modificarli.